I can do this stuff myself. No? All right, can you give me a couple of examples? Don't recurring payment systems do this on their own? So, can you give me a complete list of payment gateways you support? What exactly do I need to run a subscription-based business with SubscriptionBridge? I already have a subscription sign-up form. Can I keep it? I already have an account management area of my Web site. Can I use it? I run a Web startup: is this a subscription billing system that I can integrate into my application? Well, that all sounds pretty good: where do I go next? who's going to follow up with the customer, repeatedly, until you get paid? how frequently should you follow up? should you turn the product/service off at some point? That's the sort of thing that SubscriptionBridge will help with. 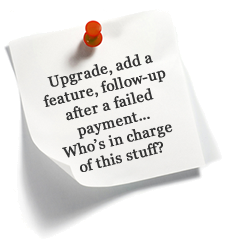 For instance, you can schedule multiple, automated follow-up's when a recurring payment fails. Unless you automate some of the customer service tasks that come with managing a subscription, someone will have to personally get involved, which means a higher costs for you, and no benefit to the customer. Customer wants to add a feature to a subscription (e.g. add additional storage to an online backup solution). Customer's latest subscription payment failed. SubscriptionBridge can take care of these tasks for you. For example, it does boring and somewhat complicated stuff like calculating pro-rated charges for the current billing period when there is a change in the subscription amount after a new feature has been added. Nope. They typically focus on the payment stuff (which is great and which is why we leverage them in SubscriptionBridge), not on the customer service side of things. Here's a page that talks about everything you need. Keep in mind that to try SubscriptionBridge, you don't need an account with one of the supported payment gateways. There is a "fake" payment gateway built into the system exactly for that purpose. So you can start your free trial at any time. Yes, you can certainly keep it. In that case you won't use the built-in checkout, but rather will leverage the SubscriptionBridge API. Instead of submitting data to the payment gateway directly, the form will submit data to SubscriptionBridge. Ask your technical staff to review the subscription SubscriptionRequest call in the API. It's entirely up to you. You can use the tools that are built into SubscriptionBridge, such as the built-in checkout (view demo) and built-in customer center) , for a speedy and inexpensive implementation. The only trade-off is that you have limited control on the user interfaces. Or you can use the SubscriptionBridge API to have more control on where and how subscriptions are managed (e.g. where customers can update their payment profile). This requires some custom programming on your side to integrate the API, and it's therefore longer and more expensive to implement. You can also use a combination of both approaches. For example, you could use the API to initiate the subscription (using your own subscription sign-up form instead of the built-in checkout) and the built-in Customer Center for subscription management. Note that there are some customer service tasks that are not currently available through the API and for which the Customer Center must be used. Yes, absolutely. SubscriptionBridge provides you all of the subscription billing tools you need to easily and painlessly build recurring billing and subscription management into your Web application. Add our awesome, attentive support to the mix, and you'll soon realize you found exactly what you needed. Learn more in our subscription billing for startups section.